This protein-packed breakfast contains 16% plant-based protein to start your morning off right with long-lasting fuel. Bake these at the beginning of the week and grab them on your way out the door instead of wasting money on those nutrient-depleting, sugary muffins at your local bakery or coffee shop. We agree: They taste good — but, your energy won’t last. You’ll thank us when you don’t experience that afternoon crash, moodiness and sugar cravings. These protein-packed muffins are part of our vegan meal plan. Download the 1 or 2-week version below and create this plan in your 8fit app today. 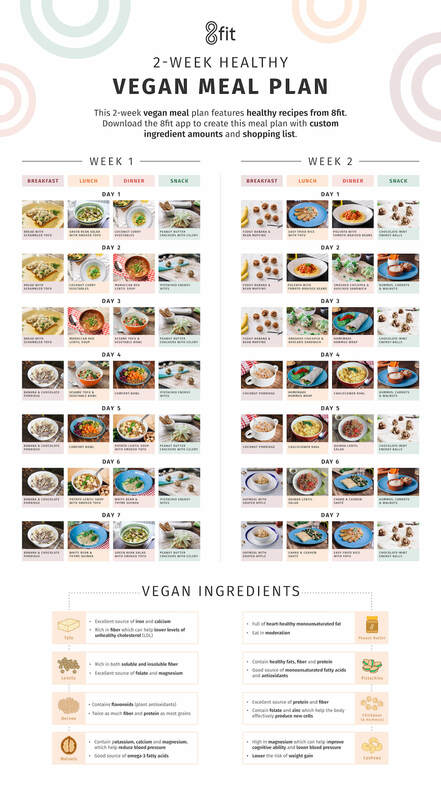 Don't forget to check our 1 week and 2 week meal plan infographics. Beans and whole grains are the perfect pair. When eaten alone, white beans and whole grains are both excellent sources of healthy carbohydrates and protein. When eaten together, they create the ideal blend of essential amino acids (protein). Grains have minimal amounts of the essential amino acid, lysine, while beans have minimal amounts of another essential amino acid, methionine. Beans and grains work together to provide your body with all of the essential amino acids it needs. Bonus: It’s suggested that the nutritional and phytochemical components of beans, when coupled with those of whole grains, may also have a synergistic effect that provides significant health benefits. This means that these foods work together to help your body absorb the nutrients you consume. The beans and whole grains in these muffins aren’t the only sources of protein. Peanut butter contributes healthy doses of protein as well as the powerful antioxidant, vitamin E, and immunity and energy-boosting, vitamin B6. Buy brands with separated oils and without hydrogenated oils or added sugar as these processed variants can lead to increased cholesterol levels and inflammation. Preheat the oven to 350°F (180°C). Line muffin cups or a baking form. Drain beans, rinse well, and then pat dry. Put all ingredients into a blender or food processor and blend until smooth. Pour into muffin cups or baking form. Bake 20 minutes. They won’t be fluffy and will look a little underdone. Let them cool for 20 minutes or enjoy straight away.